Vidyaranya was started in 1991. It aims at holistic and integrated development of beneficiaries in all spheres of life. Vidyaranya focuses on Bangalore urban, Bangalore rural, Hassan, Chikkaballapur, and Ramanagar districts of Karnataka. The NGO believes in executing overall development programmes for women, the aged, special children, orphan and street children from socio economically backward sections of Society. At the outset, Vidyaranya focused on health and sanitation with support from CAPART, New Delhi and later moved on to help children with special needs through its Integrated Education for Disabled Children (IEDC), a programme supported by the Ministry of Human Resource Development (MHRD). Vidyaranya runs a project ‘Open Shelter Home’ for street children in Bangalore in collaboration with Ministry of Women and Child Development, New Delhi under Integrated Child Protection Scheme (ICPS). The children are rescued by outreach workers and provided temporary stay facility. The children requiring long term care are referred to the nearest shelter or children’s home. These children are provided with opportunities for education, and are reintegrated into families/the community or are given, alternative care. A project ‘Rainbow Home’ for orphaned and semi orphaned girls is run by Vidyaranya in support with Partnership Foundation, Netherlands. The project aims to provide the girls with basic requirements and streamline them in Government Model Primary School, Kodihalli. Vidyaranya runs residential schools ‘Daarideepa’ (for visually impaired children) and ‘Spruthi’ (for mentally challenged children) recognised by the Government of Karnataka. The objective is to ensure availability of basic necessities, treatment and training to help them succeed in life. Under the Swadhar programme sponsored by Ministry of Women and Child Development, New Delhi, two rehabilitation centres Sarojini and Sanjeevani were started for oppressed women. Ujjwala, yet another programme works towards rescue and rehabilitation of women from trafficking. Vidyaranya aims at social and economic rehabilitation of women through education, training and counselling. Vidyaranya runs two homes for the elderly (Gandhi for women and Hosa Belaku for men) and ensures proper food, accommodation and medication to the inmates. In addition to its core programmes, Vidyaranya also works for other research projects and deprived children in urban areas. It also runs a missing children bureau and mobile health clinic. 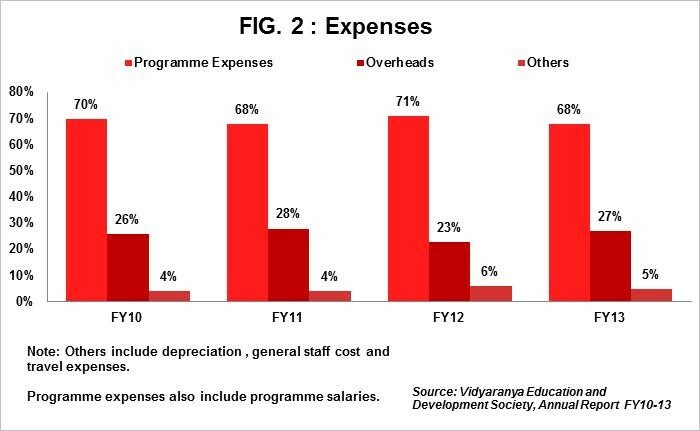 Government Funding: Vidyaranya has managed to raise funds through various government departments which accounted for 56% to 69% of its total income during FY10-FY13.In FY13, the funding from government agencies was to the tune of 60% (Rs15mn) of total income. Donations: Funds raised through agencies such as United Way and GiveIndia form part of donations. In FY13, donations accounted for 30% (Rs7mn) of total income. General donations have been in the range of 29% to 36% during FY10-13. Foreign Sources: Funds sourced through foreign agencies such as Centre for Equity Students and Give Foundation, U.S.A accounted for 9% (Rs2mn) of total income in FY13. The funds were utilised for the Rainbow Home Project. (Ref Fig. 1). Direct Programme Expenses: In FY13, total expenses were Rs25mn. Of this, 31% (Rs7mn) was spent on programme activities (sector average: 68%) and 37% (Rs9mn) was spent on staff salaries (sector average: 19%). Salary includes salaries paid to outreach workers, staff of their residential schools, old age homes and rehabilitation centres and has been in the range of 32% to 36% during FY10-FY12. Vidyaranya needs to incur the higher cost to retain quality staff. Overheads: In FY13, 27% (Rs6mn) of total expenses were incurred on overheads against the sector average of 16%. The high overheads were on account of expenses to the tune of Rs4mn incurred on rent and maintenance of the shelter homes, residential schools and old age homes and have ranged between 23% to 28% during FY10-12. (Ref Fig. 2). Current Assets: In FY13, current assets included grants receivable of Rs9mn and accounted for 82% (Rs10mn) of total assets. Grants receivable accounted for 87% of total current assets. General Funds: General funds have recorded an increase from Rs6.5mn in FY12 to Rs6.7mn in FY13 on account of marginal increase in surplus Y-o-Y. Loans: In FY13, loan funds accounted for 36% (Rs4mn) of total funds and were termed as loans against grants receivable. The loan consists of funds lent by management due to a shortage of funds. The loans are repaid on receipt of the grant. Income Growth: Vidyaranya posted total income of Rs25mn in FY13 and recorded a marginal increase in growth rate from 29% in FY12 to 30% in FY13. CAGR of income was 21% during FY10-13. Funds utilisation ratio: The ratio measures ability of an organisation to utilise cash received during the year. The ratio of 99% in FY13 indicates that Vidyaranya has utilised 99% of the funds received for its activities. Self-sufficiency ratio: The ratio is 31%. The ratio measures ability of an organisation to meet expenses from its own funds. Own funds include donations, interest income, and membership fees. The low ratio is on account of small proportion i.e. 30% of total income pertaining to donations. Dependency: Vidyaranya largely depends on government funding and has been able to garner government support for its activities. The share of government funds ranged from 56% to 69% of total income during FY10-13. Shortage of resources: Vidyaranya has limited access to funds and is just able to meet the basic needs of its beneficiaries. Other than funds, they have also been grappling with issues like volunteer management. The NGO is seeking donations in kind to satisfy beneficiary needs such as stationery, clothes, vessels, etc. However, not much response has been received on this front. Staff training: The staff skills and knowledge needs to be regularly updated to keep up with the competition. Vidyaranya lacks access to the necessary training materials and professionals to conduct training sessions for its staff. Lack of networking and expertise: Networking and optimum use of social media is of utmost importance to get visibility. Networking and crisp presentation skills are areas where the NGO needs to develop itself further. The members on Board of Vidyaranya comprise of social workers and home makers interested in development of the underprivileged. The secretary Mr. M. C. Ramesh has completed his masters in social work and works full time in the social sector. The Board meets once a year and the governing council meets once in two months. Vidyaranya is listed with reputed accrediting agencies. In FY13-14, the NGO received the state award for providing services to disabled children.